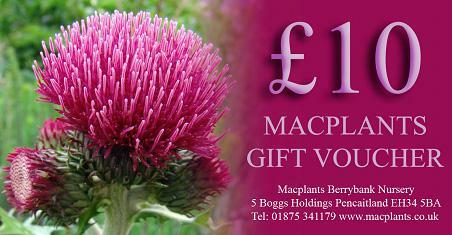 We offer our own unique Macplants gift vouchers in a range of values. These are supplied with a gift card, which we supply blank for you to add your own message, or if you would like us to send direct as a gift we can add your personal message for you if you supply the details. Vouchers can be purchased from the nursery, by post or online (card and postage free). They can be used to purchase goods online or at the nursery.